Millinery is an age old craft/art. Would you like to learn how to make a hat too? Don't know where to start? Or are you among those who are unable to attend a class, for some reason or other? Now you have your own online Instruction Book on how to make hats. All my life I have loved hats - loved wearing them, loved admiring them, and for almost 20 years have loved making them. 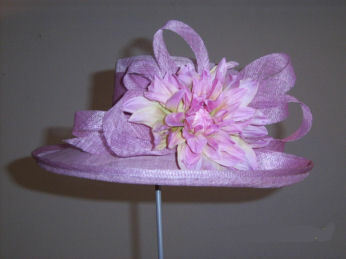 Actually, I confess, I am passionate about hats, and have been teaching Millinery for more than ten of those years. This passion also led me to be part of a team to instigate the now bi-annual Australian "Hats Off" Millinery Conventions, which enables interested people to learn, share knowledge and form firm friendships with like-minded people, milliners, students or potential milliners. 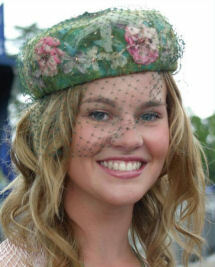 Adding head wear to compliment fashionable clothing is now more popular than it has been for a number of years. Up until the 40's and 50's saw times when ladies didn't leave their home without a hat and gloves. Today, fashion is far more casual and undisciplined. In Australia, our lifestyle was such that there were occasions when anyone wearing a hat would "stick out like a sore thumb", but now, I believe that this has gradually diminished and people have more fashion confidence and are venturing out in many different styles on all sort of occasions. We live in a hot climate and our summer definitely requires some protection from it. Skin Cancer is a growing concern and it is mandatory for school children to cover their heads during our summer, and there is nothing better than snuggling under the protection of nice warm winter head-wear. I am hoping that the youth of today will continue to be the hat wearers of tomorrow. The addition of that fabulous hat can make such a difference to the overall look, I am always amazed at the compliments I receive when I add a piece of millinery to what I am wearing, and these are from both males and females. I can wear the same outfit, without the hat, and not get any comment. My niece was invited to a wedding, the invitation added a note to encourage the ladies to wear hats - at the time, hats were not considered wedding fashion, I am pleased to say that is changing - Claire, borrowed one from my collection, however I do think it was with some trepidation. She returned my hat with a renewed appreciation, saying that she couldn't believe how many compliments she received and that it created many opportunities to strike up conversations with other guests, who may not have spoken otherwise. My love of hats and my passion for teaching Millinery has prompted me to develop this website to help milliners, students and anyone interested in designing and constructing beautiful fashion hats of many styles. This web site will continually provide quality information, guide you through the process of creating exclusive millinery designs to compliment that favorite garment. You will be able to discover the many different types of hats that have been worn over many decades and I will endeavor to give as much description as possible to enable you to become familiar with each style. There are specific blocking equipment and necessary tools required to make your journey to learning this unique craft as easy as possible. The materials used are varied and some have been around for many years and others that are still being introduced to the art of millinery. Like all fashion, hat trends evolve, what is fashionable today, may not be tomorrow. None the less, the 'vintage' styles are still bobbing up within today's fashion and will probably do so forever. Interestingly, the techniques used for the hats of yesteryear have not changed by a huge degree, although the materials may have, and so need to be processed accordingly. The information on this web site will introduce you to the necessary blocking equipment required for hat-making, the unique materials and trims which are used in the process, as well as the shortcuts and techniques to achieve a professional finish. You will find a gallery of my creations and some will be included in the instruction pages so that you can relate to my own 'style' as well as others. I will be continually adding to this educational site on making hats, you can contact me if there are any Millinery techniques you would like to know. Also, if you would like to have your own website, similar to mine, can I suggest you click on the Solo Build It Bar below. This website wouldn't exist if it wasn't for SiteSell. 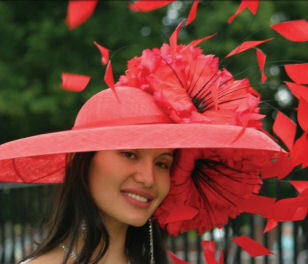 Learn about Lorraine Gill Creations and her millinery business and how she can outfit in the hat of your dreams.